Community service is important to Chino Valley Quilters. We are proud of the dedication, generosity and care our members bring to our neighbors. 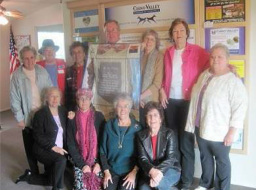 The Chino Valley Quilters Comfort Quilt program is our largest community-outreach activity. Throughout the year, members create quilts to be donated to a variety of community organizations, many whose primary purpose is to support area families in need. Chino Valley Quilters supports education and youth programs in our community. Our members work with area students and other children to pass along quilting knowledge and skills, and love of the craft. We also strive to include children and young people in our events and special activities. 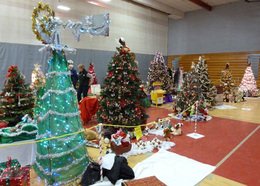 ​Hometown Christmas is a Chino Valley holiday event that combines arts, crafts, seasonal joy and good will. The Town of Chino Valley organizes a tree-decorating event among local businesses and organizations that helps families in need while also spreading cheer and pleasure among Chino Valley neighbors. As active members of the Chino Valley Area Chamber of Commerce, we regularly participate in Chamber events. We display our Opportunity Quilt at functions, team up with local businesses to promote success in Chino Valley and provide prizes and other items for Chamber events. Chino Valley Quilters members create quilts for many community-support projects, often donating their own fabric and materials in addition to their time. Because there is ongoing need for Comfort Quilts and other donations, we always need materials. We also welcome financial donations toward purchase of these supplies. To donate, contact us by using our handy contact form.